Bench Top Spray Booth – Also known as the Tabletop paint booth can rightly be stated a workhorse of many colors. 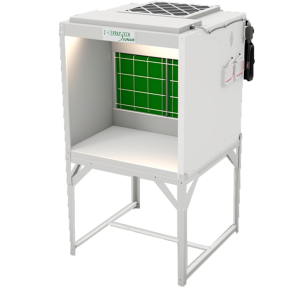 It may come as a surprise that one of Spray Tech / Junair’s most popular enclosures is a 42” cube – affectionately known as the “ Table top / Bench top” – with well over a thousand worldwide installations in countless venues and applications. 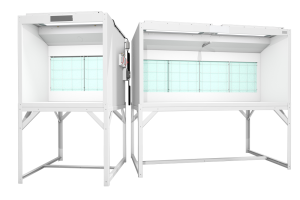 Built to the same exacting standards as all Spray-Tech / Junair booths, the bench top booth was conceived more than a decade ago as the perfect solution for all sorts of jobs where conventional exhaust ducting is either impractical or impossible to install. When the bench top spray booth is used for painting, three pairs of filters are employed. The high-efficiency paint arresting filters capture more than 99% of a wet spray and are followed by a stacked pair of woven pleated filters, which capture any residual wet or dry particles. These filter pairs are monitored with two manometers, which indicate when it is time to change filters. The final pair of filters consists of high-grade activated carbon. Activated carbon filters are made with highly porous charcoal, which has the ability to absorb volatile organic compounds (VOCs), typically the evaporative petroleum products used in traditional paints and stains. The filtered air is then returned to the workplace.